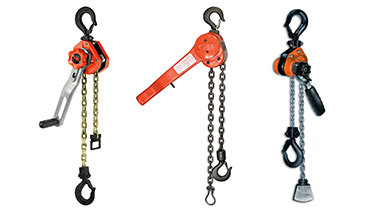 The ideal solution for pulling, rigging or lifting! 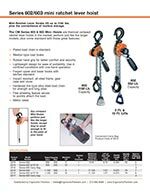 Lever hoists and come alongs are perfect for many applications as they are easy to transport and can be used in small areas. 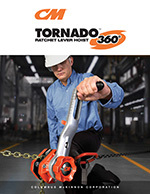 They are extensively used by plant maintenance personnel and in the construction industry. 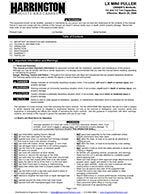 Select a product below to learn more about our various come alongs for sale. 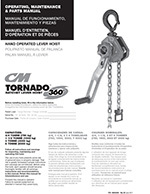 CM Tornado 360° is a "one-of-a-kind" lever hoist that can be operated like a conventional ratchet lever -OR- operated using the lever in hand crank mode with the fold out handle! 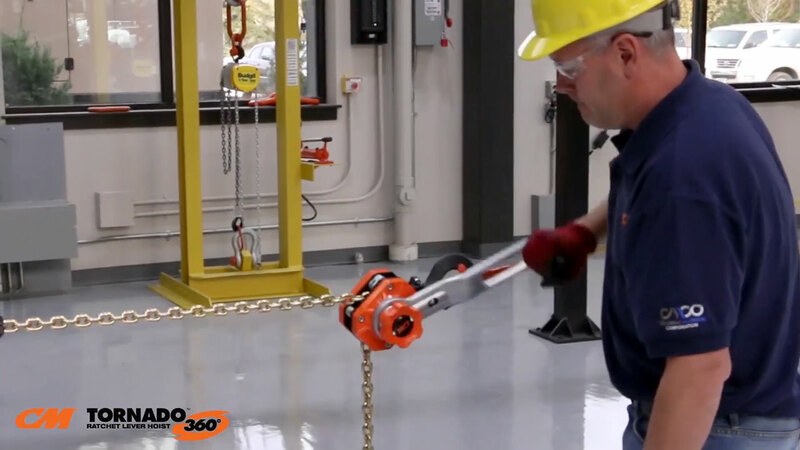 The ergonomic design allows operators work up to 12 times faster with 30% less pull force than conventional ratchet lever hoists. TOR075 3/4-ton 5ft., 10ft., 15ft., 20ft. TOR150 1.5-ton 5ft., 10ft., 15ft., 20ft. TOR300 3-ton 5ft., 10ft., 15ft., 20ft. TOR600 6-ton 5ft., 10ft., 15ft., 20ft. Custom lift lengths are available. 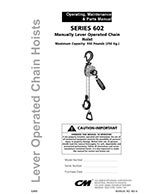 The CM Series 602 and 603 Mini Ratchet Hoists are designed to be conveniently stored in your toolbox while performing like larger models. 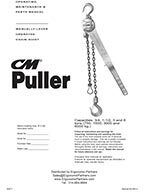 The CM 653 ratchet lever hoist is the industry standard for jobs that require a short lever arm for close quarter pulling, stretching or hoisting applications. 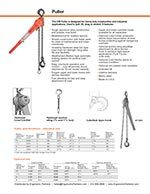 The Series 653 lever operated hoist is a high quality, rugged, steel tool for close quarter pulling, stretching, and hoisting applications. 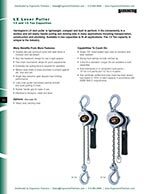 Its characteristic short handle, along with minimal lever pull effort, make this lever hoist ideal for a broad range of applications. 5310 3/4-ton 5ft., 10ft., 15ft., 20ft. 5328 1-ton 5ft., 10ft., 15ft., 20ft. 5315 1.5-ton 5ft., 10ft., 15ft., 20ft. 5329 2-ton 5ft., 10ft., 15ft., 20ft. 5320 3-ton 5ft., 10ft., 15ft., 20ft. 5330 6-ton 5ft., 10ft., 15ft., 20ft. 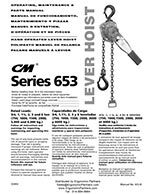 The CM 640 Lever Hoist is designed for heavy-duty construction and industrial applications, used to pull, lift, drag or stretch. 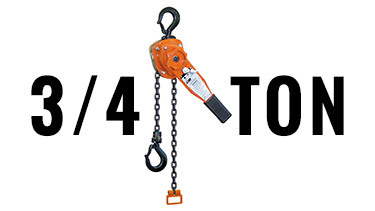 4043 3/4-ton 5ft., 10ft., 15ft., 20ft. 4045 1.5-ton 5ft., 10ft., 15ft., 20ft. 4047 3-ton 5ft., 10ft., 15ft., 20ft. 4050 6-ton 5ft., 10ft., 15ft., 20ft. Coffing LSB is widely used in the mining industry and has served industry for years. 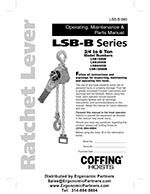 Coffing LSB-B lever hoists models are available with optional load limiters. 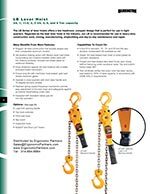 Also featuring through-hardened load chain, these stamped steel ratchet lever hoists are lightweight, durable and are ideal for construction and commercial applications. 09420W 3/4-ton 5ft., 10ft., 15ft., 20ft. 09425W 1-ton 5ft., 10ft., 15ft., 20ft. 09430W 1.5-ton 5ft., 10ft., 15ft., 20ft. 09440W 3-ton 5ft., 10ft., 15ft., 20ft. 09450W 6-ton 5ft., 10ft., 15ft., 20ft. 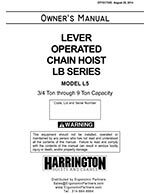 Harrington's LB lever hoists combine easy operation with a compact, low headroom design that easily handles real-world demands. 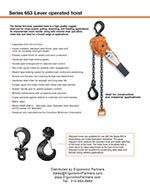 These chain come alongs can be used horizontally, vertically, inverted or at any other load angle and have the strength to get the job done. LB008 3/4-ton 5ft., 10ft., 15ft., 20ft. LB010 1-ton 5ft., 10ft., 15ft., 20ft. LB015 1.5-ton 5ft., 10ft., 15ft., 20ft. 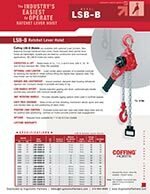 LB020 2-ton 5ft., 10ft., 15ft., 20ft. LB030 3-ton 5ft., 10ft., 15ft., 20ft. 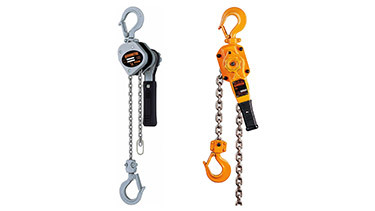 Harrington's LX lever hoists are extremely durable yet compact and ultra-lightweight. 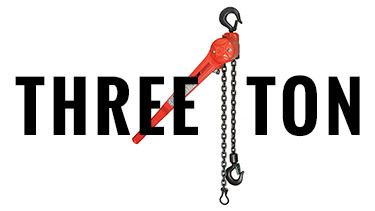 Known as the perfect "toolbox hoists", these little hoists have all the power you need to get the job done. 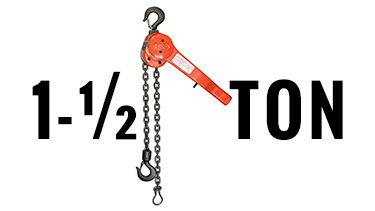 The revolutionary 1/2 Ton model is the only 1/2 Ton "toolbox" sized puller in the industry. LX003 1/4-ton 5ft., 10ft., 15ft., 20ft. LX005 1/2-ton 5ft., 10ft., 15ft., 20ft. 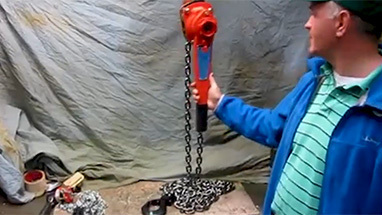 This portable ratchet lever hoist is the first of its kind that features a fold out handle transforming the hoist into a hand crank winch. 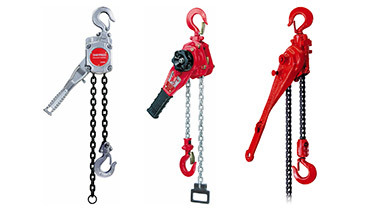 Contact Ergonomic Partners for help choosing the right lever hoist or come alongs for your application. 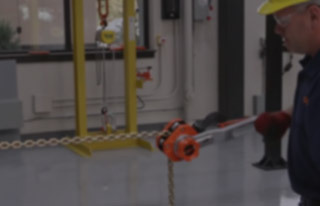 Ergonomic Partners sells, distributes, and services come alongs and lever hoists; serving clients from coast to coast, Canada, Mexico and especially focused in the states of Missouri, Illinois, Indiana, Kansas, Arkansas, Mississippi, Nebraska, Tennessee, Kentucky, Iowa, and Oklahoma.